Last Thursday, January 12 offered the latest twist on comedian Stephen Colbert's involvement in the 2012 presidential campaign. That night he learned from Trevor Potter, former FEC commissioner and general counsel to the McCain campaign, that he could not keep his Super PAC and also explore a presidential campaign at the same time. If Colbert wanted another possible shot at running for president of South Carolina, he would have to give up control of the Colbert Super PAC. As Potter explained, all he had to do was sign over the Super PAC to someone else, and then he was free to enter the electoral fray. Would that someone else have to be someone unconnected to Colbert? Nope. Could Colbert even sign it over to a business partner? Yep. Could it even be Jon Stewart? Indeed it could. Would the process be bogged down with lots of paperwork? Surprisingly, no. One set of signatures later, the transfer was official and the Super PAC had a new name: "The Definitely NOT Coordinating with Stephen Colbert Super PAC." In less than ten minutes Colbert showed viewers the inner working of campaigns, the absurdity of so-called "non-coordination" between Super PACS and candidates, and the degree to which money buys "free" speech in the U.S. electoral system. And he did all of this in a way that was entertaining. While many in the media worry about the impact of Colbert's involvement in the election cycle, they are missing the real point: Colbert makes civic lessons fun. 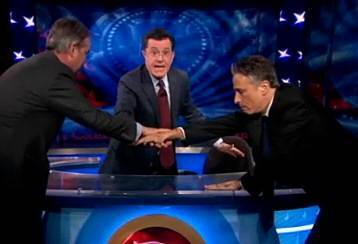 Colbert, Stewart, and Potter cheer "Non-coordination!" Colbert -- more than any other politician, activist, or intellectual -- has single-handedly brought the role of PACs and other un-democratic features of the U.S. electoral system to public attention. Colbert started by lampooning the Supreme Court's Citizens United decision, which removed restrictions on corporations spending limits on behalf of candidates. What better way to show the absurdity of the decision than to test it? So Colbert went to the FEC to apply for his own Super PAC. Over the summer the U.S. public watched Colbert, a major media power, go through the process of acquiring his own Super PAC, a move that gives him even greater influence over public opinion since it allows him to run political ads. Then in September, Colbert created his own shell corporation, a 501(c)(4) to illustrate how former Bush adviser Karl Rove was able to hide donors to his American Crossroads Super PAC. He explained that 501(c)(4)s are like a "Campaign finance glory hole": "You stick your money in the hole, the other person accepts your donation, and because it's happening anonymously, no one feels dirty! ... Clearly, these (c)(4)s have created an unprecedented, unaccountable, untraceable cash tsunami that will infect every corner of the next election," Colbert said. "And I feel like an idiot for not having one." And that isn't all. Colbert also offered to finance the South Carolina Republican Primary and tried to host a debate. So what is Colbert up to? Is he just making a joke of the electoral process? Is he, as The Washington Post suggests, potentially dangerous? Or is he just using the election to boost ratings and his ego? Has he crossed the line between reality and fiction? These questions miss the point. First of all, Colbert isn't making a joke of the electoral process. He is showing us that our electoral process already is a joke. He is only able to mock it so easily because it is an absurd system that favors corporate power and political elites. And if he is dangerous because he blends reality and fiction in ways that might be tricky for some to understand, then we have a lot more to worry about in our democracy than the satire of Colbert. If someone can't tell the difference between Rove's shell corporation and Colbert's satirical one, then we are all in trouble. The fact that much mainstream media coverage of the elections makes it hard to tell the difference between performance and politics was revealed when Colbert appeared on This Week with George Stephanopoulos. Stephanopoulos could not get out of his role and engage Colbert as a comedian. He kept trying to grill him as though he were a real candidate, while all the time trying to attack him for not being a real candidate. The exchange was absurd -- and not funny either. So, while the media and politicians and pundits worry about what Colbert is up to, he is busy giving us all a civics lesson that we won't soon forget. For the first time in recent U.S. history, the public is more fully aware of the way that campaigns get financed and it is all thanks to Colbert. He, along with Stewart, is teaching us about the inequities, flaws, and injustices that have contaminated the democratic process in the United States. And he is showing us that understanding and advocating for democracy does not have to be boring, tedious, or depressing. Will Colbert be President of South Carolina? Wrong question. What we need to ask is whether he will win the race to restore democratic values.